Galway manager Micheal Donoghue (centre) with selectors Francis Forde and Noel Larkin. Michéal Donoghue admitted that Galway were beaten by a better team in the All-Ireland hurling final. The reigning champions' bid to emulate the team of 1987-88 came up agonisingly short as Limerick held on for a one-point victory after leading by eight entering the closing stages. "We're bitterly disappointed. We just didn't get into the game but you have to give Limerick huge credit. 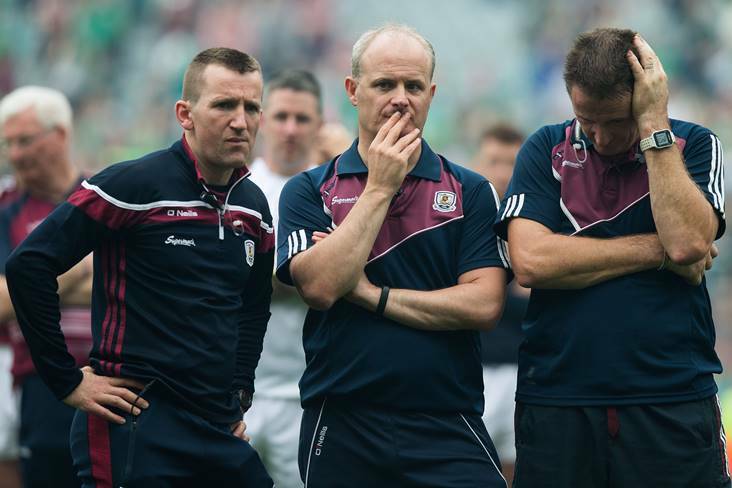 They started really well and were dominant for long periods," the magnanimous Galway manager told RTE. "I think we came back into it in the second half, but they got the crucial scores at the right time and the finish line probably came too quick for us. We weren't on it. I can be no more prouder of the lads, they fought until the end. We were a puck of the ball from getting a draw, they died with their boots on and I couldn't have asked for any more. "They fought to the bitter end. You can't take anything away from Limerick, today is their day and congratulations to them. I hope they enjoy it." Donoghue refused to blame Galway's long campaign - which included replays against Kilkenny and Clare - for their below-par display. "We're not going to make any excuses. We were exactly where we wanted to be and you have to perform and we were probably a tad off it and that's probably down to Limerick. "They came out and started well and got the big scores when it counted and congratulation to them," he added.